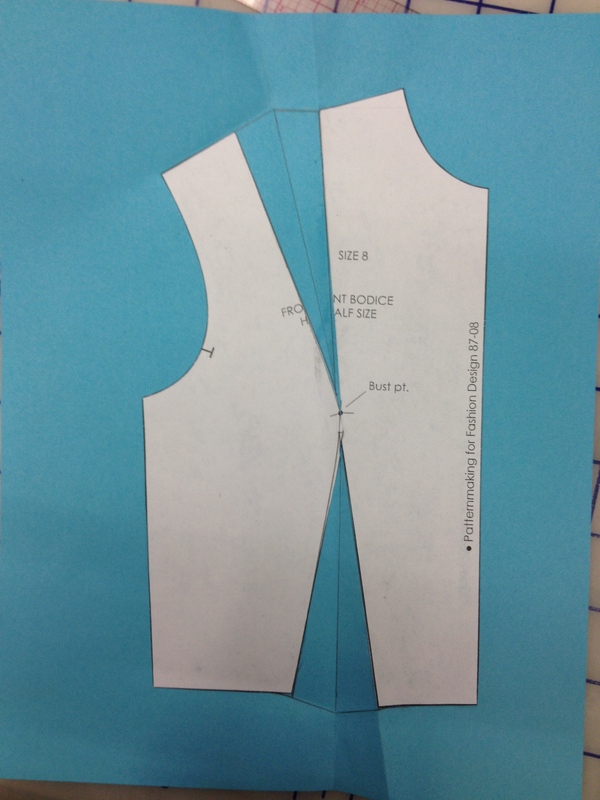 Sometimes we have a one-dart sloper, and we want a pattern with two darts. In order to get that, we have to partially close the existing dart. Mark the location of the new dart, based on the assignment sheet. Measure the existing dart uptake (the distance between the dart legs). We want to move half of the dart into a new dart, so we need to know how much dart we have to work with. In this case, it’s 2 1/2″. 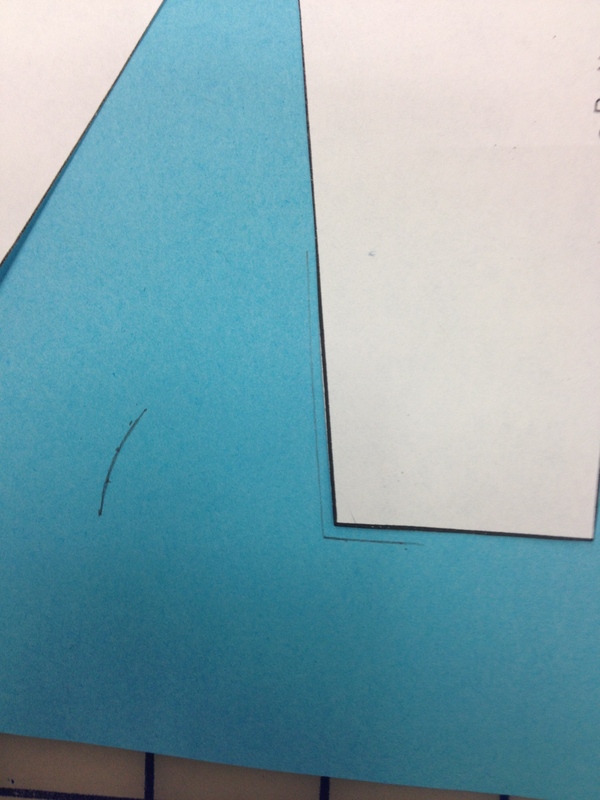 Mark the inside corner of the dart leg on your paper. (Sloper moved slightly so you can see this.) 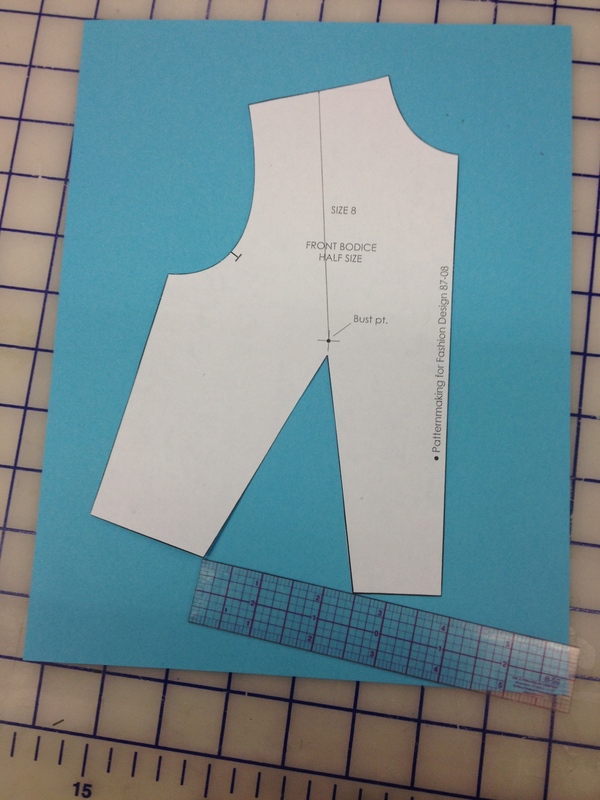 Now mark a small arc 1 1/4″ from the corner you just drew. Remember, in class we talked about radar and radio towers. 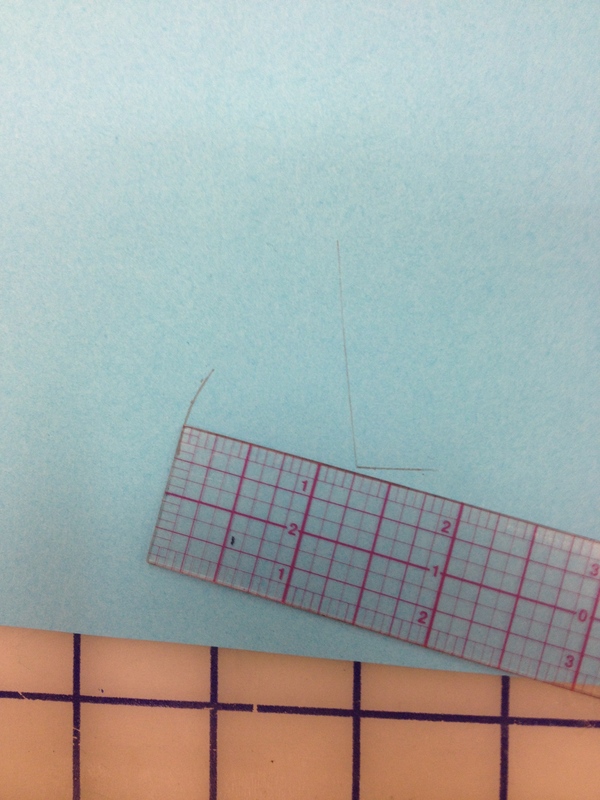 We used the ruler to make several dots 1 1/4″ from the exact corner, then connected them with the curve. This gives us a guide for closing the dart. This is because the dart swings closed on an angle. We don’t know exactly where the corner will be, so we’re marking a range of acceptable places. Cut to, but not through, the bust point along the new dart line, then up from the top of the existing dart. 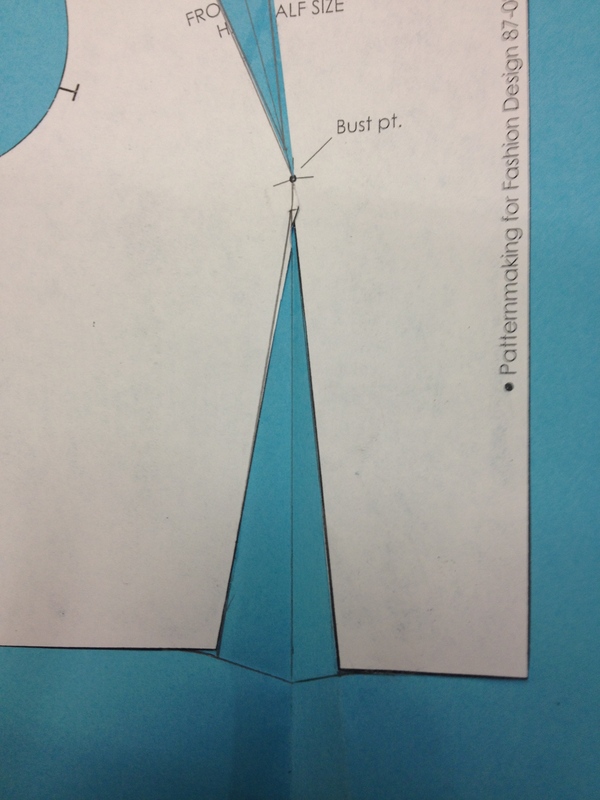 Mount your sloper on paper, making sure that the inside dart leg and bottom are exactly where you marked them. 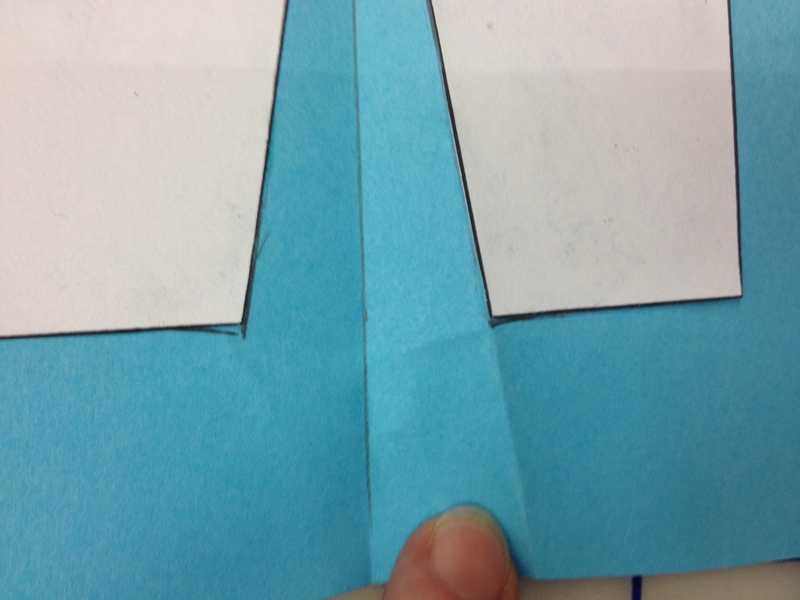 Swing your dart closed until the corner of the other dart leg is on the arc you drew. If you measure, both dart uptakes should be 1 1/4″. Draw in the new dart centers. The darts are 1 1/4″, so the new centers are at 5/8″. Mark the new dart point. It should be a minimum of 1/4 in from the bust point, on the center line. When using multiple darts, it’s very common to put the dart points farther from the bust point then you would with a single dart. 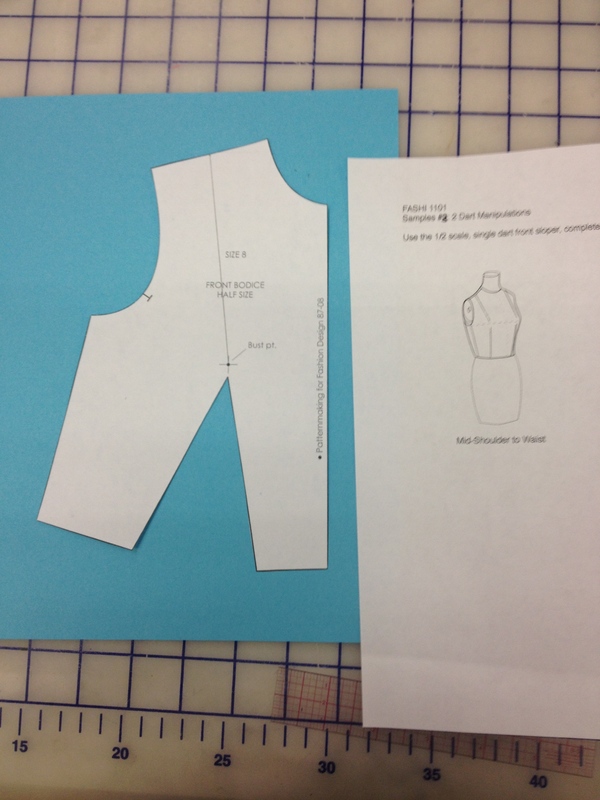 This is done to create a nicer fit. 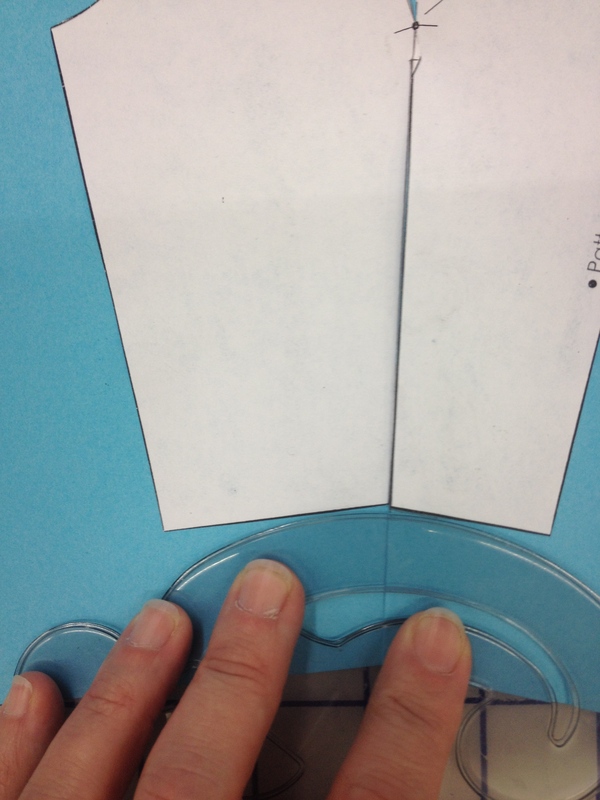 Fold your dart closed with the seam allowances towards the center front of the body. See how the dart legs meet at an angle? We don’t want that. Use a curve to create a smooth join. 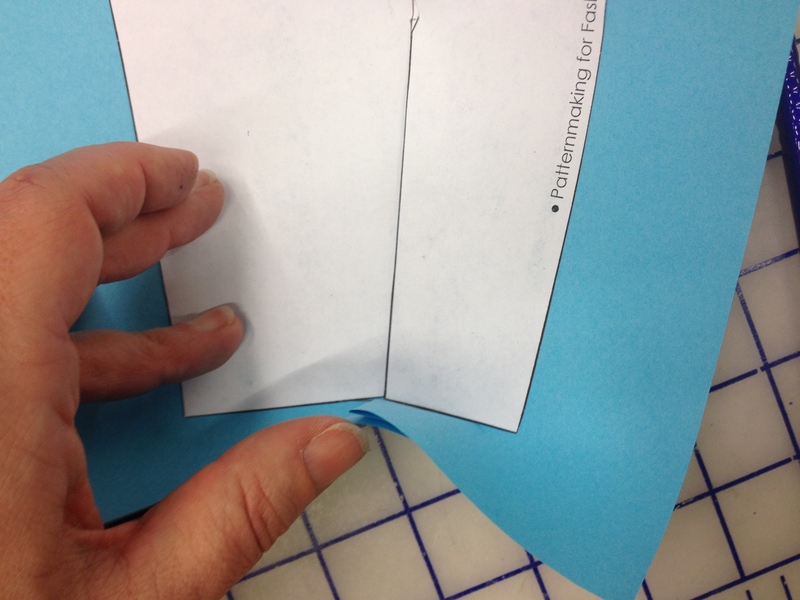 Fold crease the paper along the new bottom line you just drew. 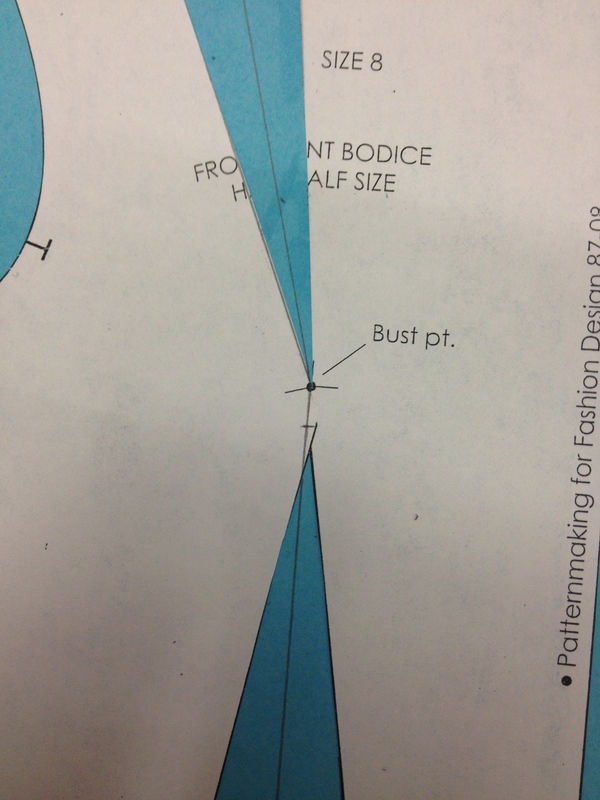 The creases that make the little tent connecting the dart legs are your dart jog. Remember, your teacher can tell when you “make up” a dart jog. Mark in your dart jog to complete the dart. Complete the top dart in the same way. Your completed draft should look like this. 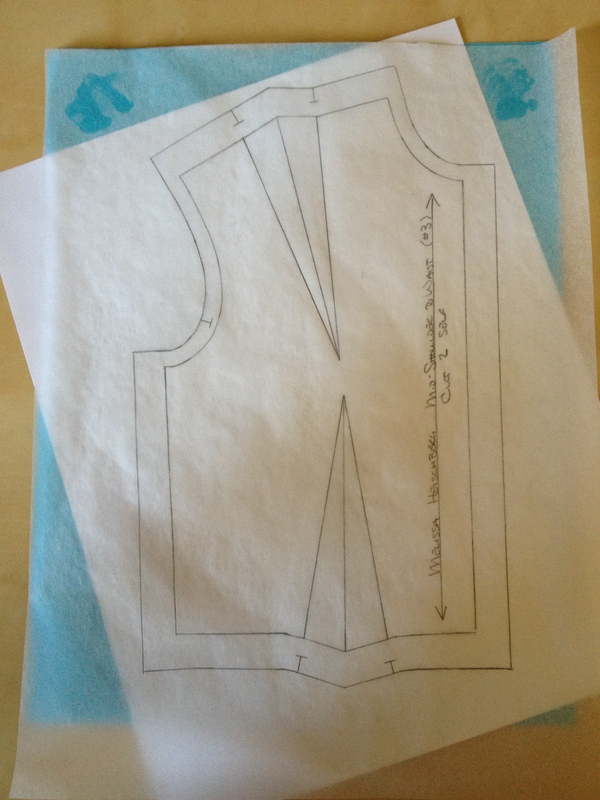 Do all of your normal pattern-making things: affix tracing paper, trace your final draft lines, add seam allowances, notches, and a labelled grain line. 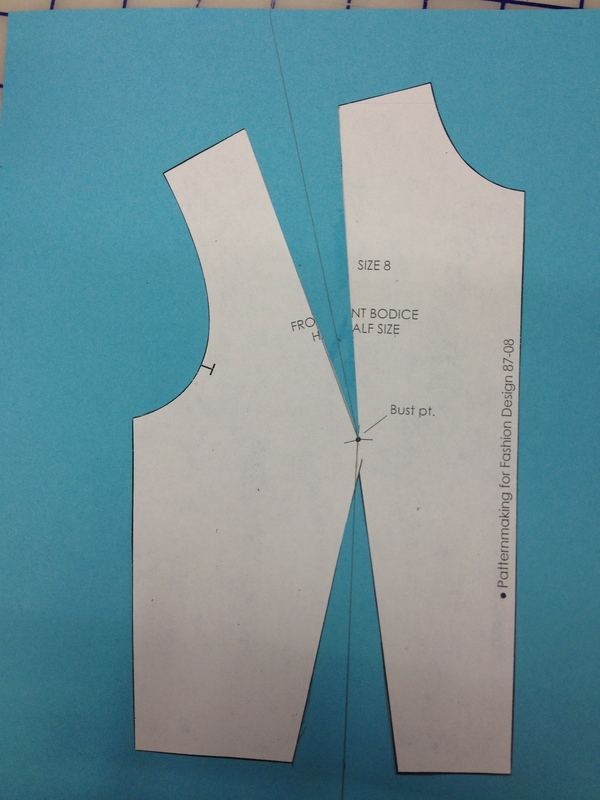 Your pattern should end up a lot like this. 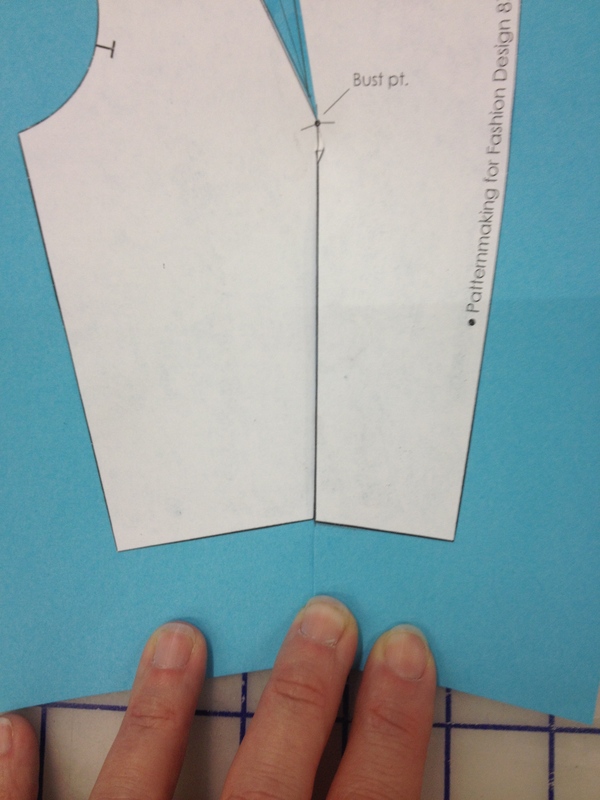 If you choose to have your piece cut on the fold at center front, don’t put a seam allowance on that line. 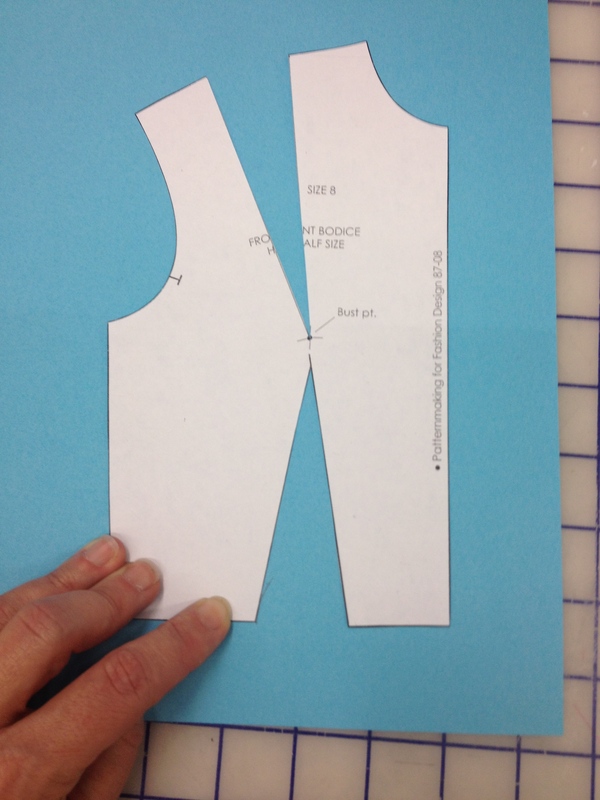 Also, make sure you indicate that the piece should be cut once.